For the last few months, Eagleton Center for Public Interest Polling Director David Redlawsk has been in Iowa, studying the first in the nation Iowa Caucuses, following up on work he and colleagues did in 2007-08 for the book Why Iowa?. Read below for Dave’s take on frontrunner Donald Trump. The rally is being held in Burlington, Iowa’s Memorial Auditorium, which hulks along the Mississippi River. 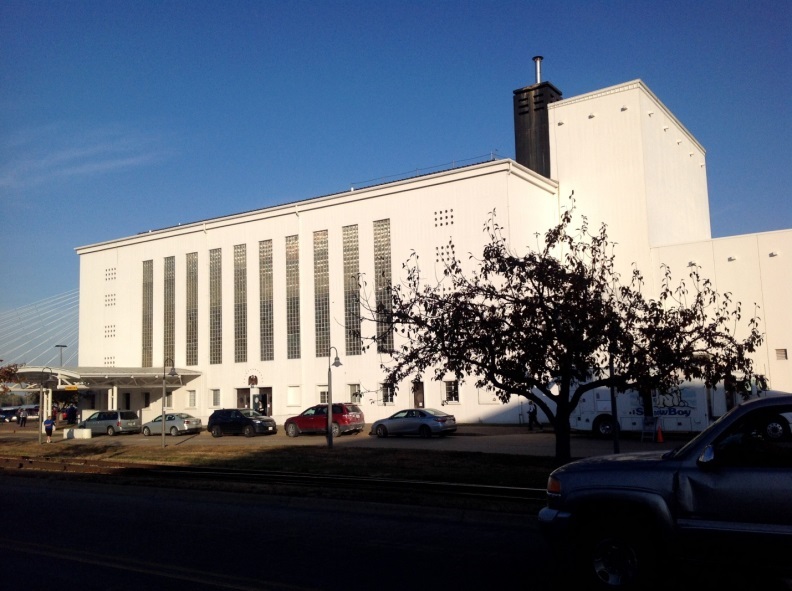 The Auditorium was opened nearly 80 years ago, and according to its website was built by the Works Progress Administration (WPA), the depression-era agency that was responsible for massive public works projects around the country. 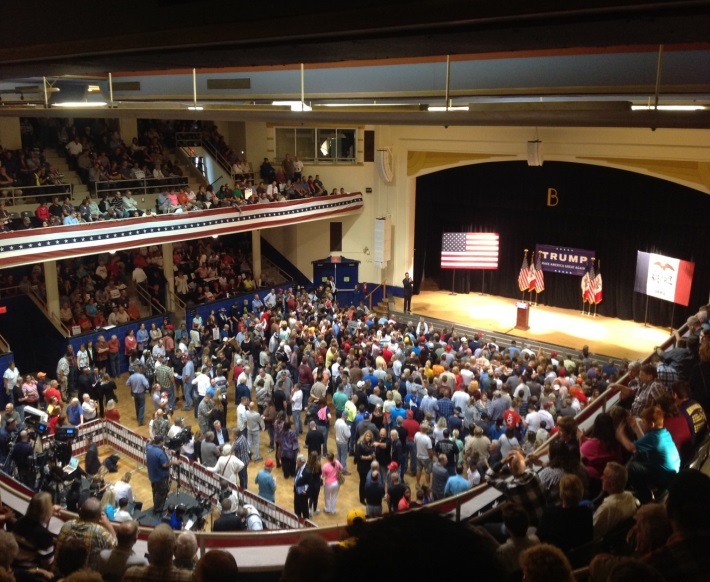 Inside, the space is perfect for this kind of rally. Big open space in front of the stage, surrounded by seating on multiple levels for those of us who did not want to stand for hours. Ironically, perhaps, the WPA was a government effort to rebuild America, physically, while putting people to work. It succeeded at least in terms of the schools, libraries, auditoriums, and the like it left behind. It was a previous era’s attempt to recover from malaise and make America great again. But it was an effort that required hard work and sacrifice. Not so the make it great again of Donald Trump. Waiting for the main event, the nearly overflowing crowd – 2,000+ people – is excited and anticipatory, waiting on the man that many see as a potential savior of our country, of our future. What fascinates me, and challenges logic, is that this savior is not one of them, did not rise out of the masses to come to save us, but instead is himself part of the moneyed elite that candidates on both sides are spending a great deal of time attacking of the aisle spend attacking. Somehow, the fact that Trump is not one of us adds to his power; it is plausible to think since he’s traveled in those rarefied circles he fully understands how to make the world do what he wants. Tana Goertz, Trump’s Iowa co-chair gives a short warm up speech reminding folks that they have to caucus for anything to happen. Given the location, many of those at the event were from Illinois rather than Iowa, so the pitch made for filling out Trump commitment cards was lost on them. But both the call for committing to caucus and an additional enticement of a Trump T-shirt for signing up as a precinct leader provided some evidence that the Trump campaign in Iowa has pivoted to the necessary ground game. But that’s neither here nor there right now. Goertz closes by calling out to the crowd in a way that almost felt chilling to me: The Trump train will steamroll anything in its way to the White House. 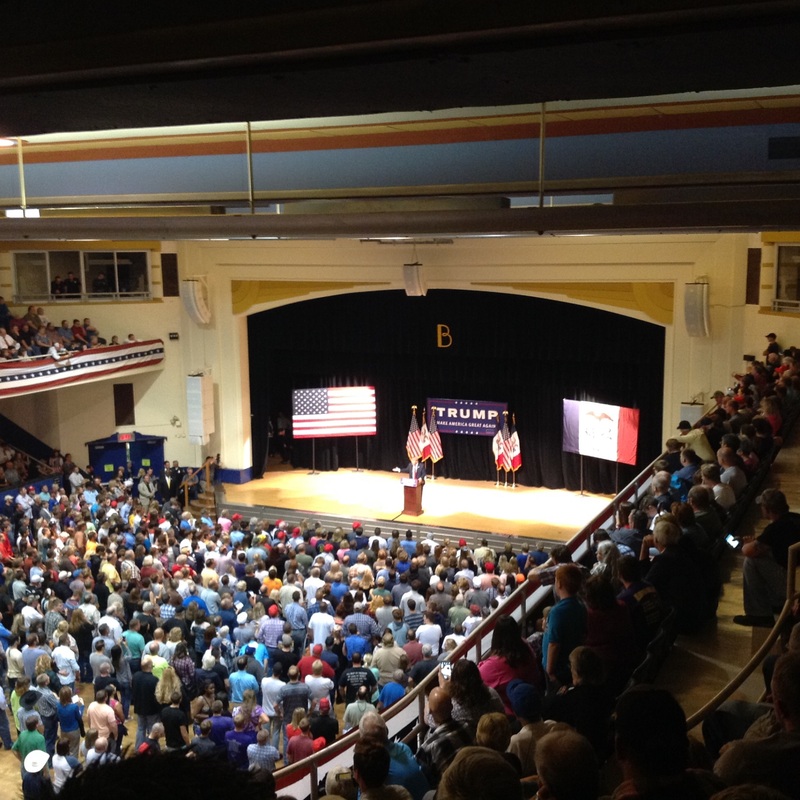 While this may or may not be the case – the day after the rally the first poll showing Ben Carson ahead of Trump was released, and more have come since – the crowd responds with a roar. What I feel in that roaring crowd is a palpable sense of desire for something, anything, that will somehow change things. What things? Well, that’s not so clear. In many cases people have specifics on their mind. And Trump himself, once he gets past the first 20+ minutes reading his poll results, does address a few issues. But for the most part, that’s not what people are excited about. Oh, sure, they cheer Trumps’ claim that he will lower taxes and simplify the tax code (“It will be beautiful,” he says.) And they seem to like the other policies he touches on. The crowd also appreciates the idea that, as Trump says, “Nobody controls me.” And they really go wild when he says “I’m a good Christian, when I’m president we will say Merry Christmas again. But they aren’t really there for all that. What they are there for is to see Trump as Trump, the ultimate salesman, who tells us that he is running because he’s tired of others failing. In particular he calls out Mitt Romney, saying Romney failed, so I have to do it myself. Trump, who no matter how much is spent against him will prevail because he is literally superman. He knows how it all works, and he will cut through it all by the force of his outsized will. As Trump goes on with an hour-long stream-of-consciousness speech, I decide that the crowd basically just likes the language. They like the superlatives, the self-referential ego-driven commentary, and yes, the demagoguery. It touches them emotionally and in the end, the effect seems to be to make people feel good about themselves just because they were there to hear it all. The rhetoric hits home. American is losing, and keeps losing. It is a depressing message and one other candidates use as well. I’m thinking here particularly of Bobby Jindal’s talk about the loss of the “idea of America.” But in Trump’s world that losing will end. Not might end, not might be fixed a little, but, as simply put by Trump, “We won’t lose any more. I will make us great. Hillary won’t have a clue about what’s happening with jobs going to other countries. Hillary would say we don’t like it, but would be hit by lobbyists. I’ll be hit, but they won’t have a chance, it’s over.” He goes on to say that he has the best people, and the best people can fix it. And the crowd continues to cheer. All that is needed to make this happen is the best people, and the best of the best is Donald Trump. Donald Trump is superman. And like Star Trek’s Captain Picard, Donald Trump just has to say it to “make it so.” The will to make it happen is the power to make it happen. All that’s missing in Washington and America is someone who has the will to just fix it, and Donald Trump tells us he has it. Who wouldn’t want that?